The usual way send data from a microcontroller is either over RS-232 with MAX232 serial ICs, crystals, and a relatively ancient computer, or by bit-banging the USB protocol and worrying about driver issues. Not content with these solutions, [Scott] came up with sound card μC/PC communication that doesn’t require any extra components. [Scott] bought a cheap USB sound card dongle on eBay (although a built-in sound card will do) and wired up the tip and ring of the plug to the microcontroller. The data is sent from the microcontroller a lot like Morse code – a short gap between pulses is a zero, a long gap is a one. 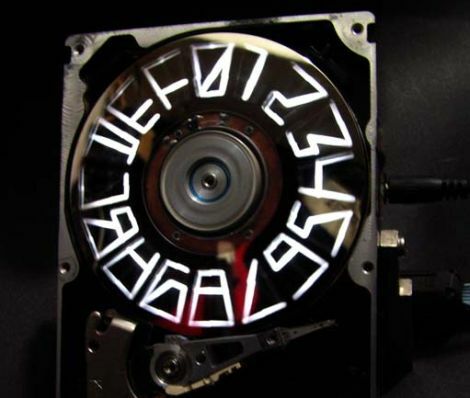 This is parsed by a Python script using PyAudio. Synchronization, timing, and calibration is automatic because of a 10-bit ‘packet header’ explained in this video. Here is an example of what happens when someone is tempted to use their hacking skills for evil. Hopefully it goes without saying, but do NOT try this one at home. When his wife asked for a divorce [Andrew Castle] obviously did not like the idea so got busy building himself a DIY electric chair, placing a metal chair in his garage he wired it up to a 240V 13 amp wall output with the intention of luring his wife to sit in the chair for “a chat”. 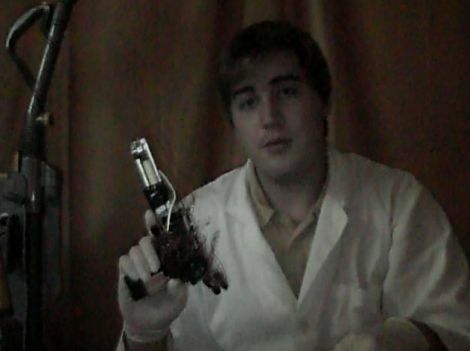 Fortunately the story ends as well as any story involving something as foolish as a homemade electric chair can end. We are guessing that [Andrews] wife’s suspicions were initially aroused when she was invited to sit in the lone metal chair in the garage, whilst he stood behind her holding a rubber cudgel. After a brief struggle she managed to escape unharmed and [Andrew] is now facing 10 years in prison. All questionable morals aside, from the brief description available it looks like there may have been a few holes in the logic (or lack of) behind the construction of the chair, for one circuit breakers come to mind. [Rob] Was cleaning out his car hole when he stumbled across a servo, a PC cooling fan, an Arduino and apparently a whole lot of bubble mixture. 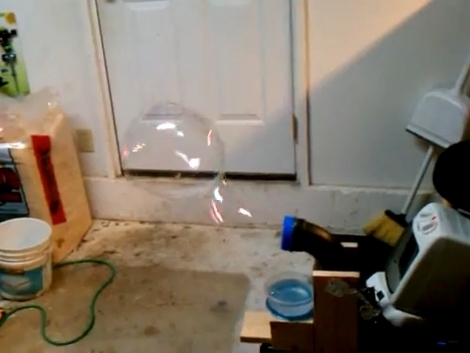 With all of this, some scrap timber and a few trips to the dollar store, he was able to whip up this bubble blowing bot to entertain his children. It looks like a fairly simple mechanism, the servo tips the old pipe bend into the sudds and the fan provides the air to blow the bubble. The size of the bubble is varied by altering the speed that the pipe bend tips. A week or so ago we featured an FPGA MIDI interface. Since then the builder has gone crazy with his FPGA and revised his code to include polyphony and PWM output, and posted a polyphony demo. In our previous coverage of the build, the synth was monophonic, and the MIDI implementation was pretty shaky. After realizing the hard work was done, [Mich] re-wrote the MIDI interpretation module to keep 8 voices in memory. Now the synth can play 16th note arpeggios at 999bpm. The original build used 8 pins to output the audio with an R/2R ladder for a digital to analog converter. This didn’t work well with a polyphonic synth (everything was clipped or noisy), so [Mich] moved to PWM output. 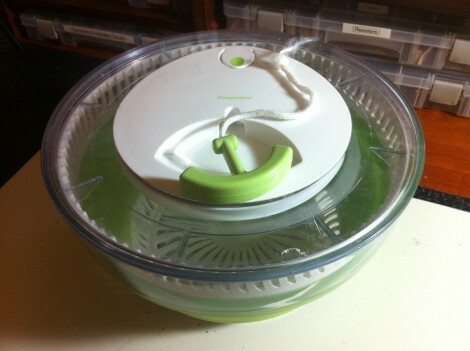 Behold [Quinn’s] broken salad spinner, and just when lettuce and other garden produce are hitting their peak. We were surprised to find out that she was able to get the mechanism apart to fix the broken cord. We’re sick and tired of ultrasonically welded plastic enclosures that lock out the most well-intentioned repairman. But in [Quinn’s] case there were a few plastic plugs hiding the screws that keep the two pieces of the case together. After diagnosing that the cause of the broken cord was a gnarly metal grommet, she removed the offender and sought a replacement cord. The first material she tried was some dental floss but unsurprisingly it only lasted through a few spins. Next on the road to repair was a shoelace which did a bit better but also ended up broken. But the discovery of some parachute cord did the trick in the end and now it’s good as new if not better!